guidelines for witnesses during direct examination and cross-examination. All topics are illustrated by way of practical examples, which also serve as a pool of useful model phrases and expressions. Practical appendices include ready-to-adapt sample documents, such as a procedural questionnaire, procedural rules and a witness statement. 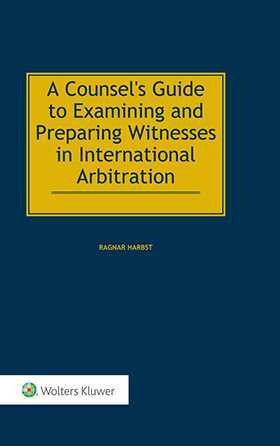 The book will be particularly useful for arbitration practitioners who have had little exposure to the adversarial approach to evidence and who wish to learn the ropes of lawyer-led witness examination and preparation. However, any practitioner stands to gain from applying the book’s practical guidance and the author’s wise counsel. CHAPTER 1 The Importance of Witnesses: Where the Documents End . CHAPTER 2 Differences between Common Law and Civil Law Systems in Regard to Witness Examination . CHAPTER 3 Convergence of the Two Systems. CHAPTER 4 The Sources of the Rules of Taking of Evidence in Arbitration. CHAPTER 5 Early Decisions: Which Method of Witness Examination Is the Best (for the Specific Case)?. CHAPTER 11 Organizing the Hearing. CHAPTER 12 Preparing the Witness. APPENDIX I Sample Procedural Questionnaire. APPENDIX II Sample Procedural Rules. APPENDIX III Sample Witness Statement. APPENDIX IV Sample Hearing Schedule.